With all the money and ease of shopping that I will have this holiday season I will have to pick up one of these Smart Money Deluxe’s for myself as well as many of that special someone’s on my gift list. The Smart Money Deluxe is the perfect gift! It is the gift that WILL be used all year and not stowed away in a drawer or re-gifted to someone else. It is made of ultra-sleek stainless steel and can hold all all of the credit cards and up to 30 bills for that big spender in your life. 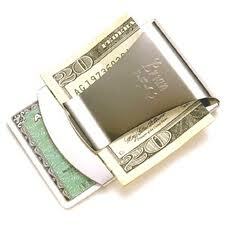 Who wouldn’t want to flash their cash with something as cool as the Smart Money Clip Deluxe? Why hide your wealth in your bill-fold, fold-over or crumbled up in your pocket when you can show them that you really care by giving them the Smart Money Clip Deluxe for Christmas, Hanukkah, Kwanza or even Festivus. Available today for $19.95 (plus shipping and handling, sorry NO C.O.D.’s) I have also seen this gift at the local 7-11 convenience stores around Denver.